You have to admit, that shopping for cute umbrellas is pretty much the only cheerful thing about the rainy spring weather. Of course, while umbrellas are practical, kids love the idea of a colorful, cute umbrella that features their favorite color or animal. For many years, umbrellas were a sign of wealth and power and only used as a practical accessory by adults. However, with the creation of Mary Poppins, I can imagine that children became more interested in the whimsy that an umbrella holds. 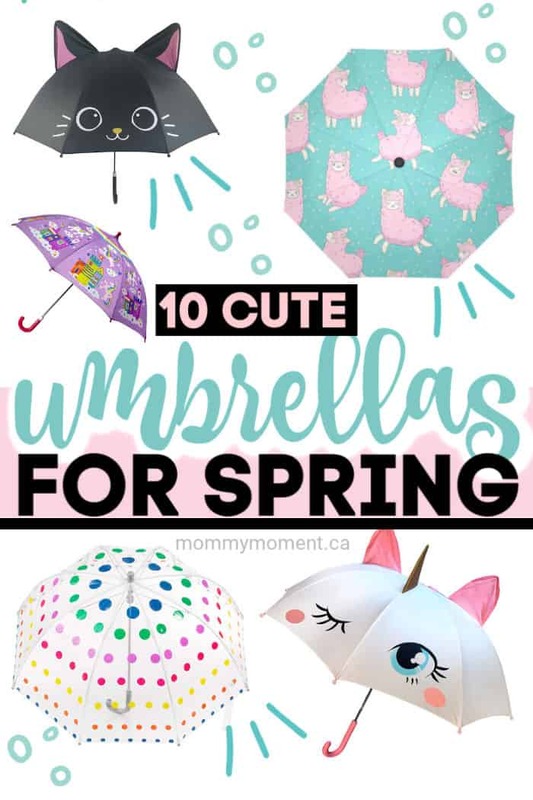 These 10 Cute Umbrellas for Spring are the perfect accessory to any child’s raincoat! SMATI KIDS TRANSPARENT UMBRELLA DOME – this transparent umbrella features a reflective stripe perfect for walking outside after the sun has set. CHILDREN’S RAINY DAY UMBRELLA – this umbrella is made from durable polyester material and features 25 different animals and designs to choose from. LLAMA PATTERN UMBRELLA – this llama patterned umbrella is made from windproof material and features an automatic open and close button. TOTES KIDS CLEAR BUBBLE UMBRELLA – this lightweight kid’s bubble dome umbrella has a pinch proof closure and the perfect sized handle. POP UP SHARK UMBRELLA – your child will love the pop-up features of this shark umbrella. The fins and tail stick up making it look like a real shark! UNICORN UMBRELLA – this unicorn umbrella is perfect for unicorn lovers! Specially designed for kids, it features a super easy open and close mechanism. TRACTOR UMBRELLA – featuring a wooden handle, your little one will love staying dry under this umbrella with tractor print. CONSTRUCTION UMBRELLA – fun and functional this umbrella features colorful and exciting patterns. SKIP HOP ZOO – this Skip Hop Zoo umbrella features the adorable signature Skip Hop Zoo characters and pairs perfectly with a Skip Hop Zoo Raincoat. UNICORN COLOR CHANGE UMBRELLA – when wet, the unicorns on this colorful umbrella change color! I love those umbrellas, my favourite is the black cat!